Right.. Back to the mask! 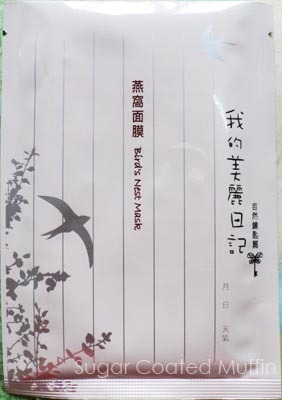 Lol I'm not sure if bird's nest actually smells of anything (urgh... dried saliva, anyone?) but this mask smells nicely of honey. Phew..
Sheet is like the other upgraded masks. Good fit, thin, comfortable and moisturizing. Still covers my upper lip.. Pfft.. Mask stayed very moist after 15 minutes. This mask functions to nourish & whiten. I can't comment on the nourishing part but it did give my face a certain 'glow from inside' but no brightening effect. 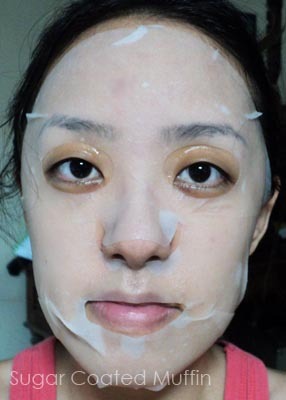 Its very hydrating (I think most of the upgraded masks are), leaving my skin soft and plump.